Seven Sheridan High School students were recognized at the Family, Career, and Community Leaders of America Leadership Conference Dec. 2, 2015, which was held at the Phillips Community College Grand Prairie Center in Stuttgart. They were recognized for their performance at the STAR Events, which were held Nov. 4, 2015 in White Hall. The STAR Events are competitive events in which members are recognized for proficiency and achievement in projects, leadership skills and career preparation. Amber Goudy and TJ Dunn won gold medals for their category, Promote and Publicize FCCLA. Lacey Lively, Abbi Morton and Jordyn Plunkett won silver medals for Life Event Planning. Madeline Martin won a bronze medal for Illustrated Talk, and Hunter Strom won a bronze medal for Advocacy. 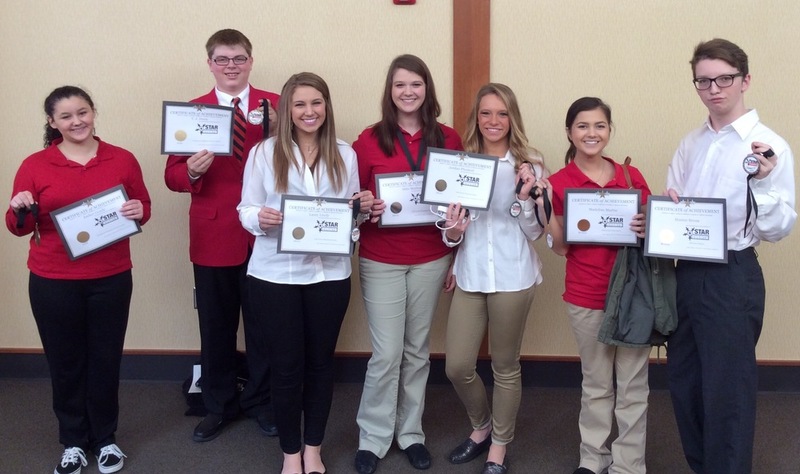 In all, 21 SHS students attended the FCCLA Leadership Conference. TJ Dunn, who is a district officer (vice president of programs), led the meeting alongside other district officers. Additionally, Hunter Strom was inducted into the 2016-2017 District IV Office and will hold the treasurer position.